Music for audiophile indulgence, no nonsense boogie or audiophobic avoidance? The opening paragraph usually spoofs a literary style to match a featured release and this was to be no exception until I sat down to write, accompanied by the the first CD on the list. Divine would be the obvious cliché for this incredibly well recorded and incredibly inspirational a capella gospel outing. If this doesn't offer listeners faith in a better world to come, then nothing will. Played at a HiFi Show, visitors would assume a house church had taken root in one of the rooms, singing live. The voices are beautiful, the recording has unsurpassed microdynamics and the occasional tambourine is more a killer test of timing than anything on a test disc. The performers are so filled with joy the listener cannot help be reminded that the freedom of which they sing is as much the (covert reference to) freedom from slavery as the (overt reference to) freedom from sin. The combination of this recording through a 300B based single ended valve system is sublime. The distant voices of the congregation adding their concord to the sung sentiments offer as much 'you are there' illusion as audiophile classics (cliché?) like Pawnshop and the macro-dynamics of the applause at the end demonstrate the intelligence of cutting CDs at low enough levels to fit real life dynamics without squeezing. This is one of the ultimate CDs of ensemble voices. "that sticks in every player from deluxe audiophilia to ICE, on first few plays" cry plebs chorus, stage left, "Until the old scribe polished it radially with a Reveal wipe and washed it with warm water"
Which really oughtn't to happen with a label dedicated to maximum listening pleasure. Once the disc surface was suitably cleaned and polished this disc revealed ["Aaargh - bad pun alert!" shriek plebs] some of the most sublime audio quality and songwriting and production this side of a loose guitar songwriting jam between Jerry Garcia and Neil Young, Pip Pyle on skins, and Lee Sklar alternating with Donald 'Duck' Dunn on bass, directed by Robert Hunter in your own (recently extended and acoustically designed) sitting room. That's your old scribe's immediate impression without resort to notes or fact checking. If that description immediately conjours an impression in readers' minds, then those readers should buy this CD now. If that description actually prompts the urge to write to (UK satirical magazine) Private Eye's Psued's Corner, then the opposite applies. This CD is psychedelia unexpectedly from the East Coast, infused with jazz influences but expressed with that raw urban syntax more familiar to Europeans than Californians. More NY grit than LA grit; more Brooklyn than Watts. "well, famously, the Byrds did play Dylan without irony," explain plebs chorus, stage left, "and jolly splendid it was too!" And Esther Williams is credited among background vocals without a hint of a grin nor chlorine. Jack Bryant, bassist and coordinator, helped reconvene his old classmates over 40 years from their '67-'68 heyday but was shocked at Mapleshade's apparently antiquated and primitive tech, but alert enough to realise the 'human' possiblitibes this human scale technology could contribute. 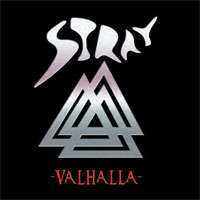 Tonight's CD named after their one UK hit Drummer Man. A 1977 first recording contract might have tempted them to deskill to the prevelant punk baseline. Instead this bunch, who's manager believed in them to the extent that he had sold his own property to finance the band, became the first (and only) to record on the new imprint of Target Records, named TDS Records. In 1978 their hit single Drummer Man reached number 14 in the UK Top 20 (BBC) but had far wider impact than this statistic would imply. That record was ubiquitous; UK radio had been recently openned up to independent local stations a couple of years before and the proliferation of new AM stations embraced this disc such that it became the soundtrack to contemporary adolescence and the term power pop was allegedly coined in its honour. Read on, dear readers, read on, replieth ye olde scribe. 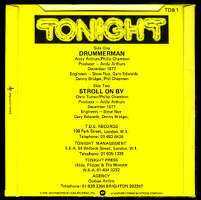 Track 3, Stroll On By was the B-side of Drummer Man and every bit its equal, should have been a 'bought with' double A-side or the follow up (ain't hindsight a wonderful thing). Fellow travellers from Sarfend, the Kursaal Flyers and Eddie and the Hot Rods , combined with their 5 miles down the road Canvey Island neighbours Dr. Feelgood must've been more influential than the punk of the metropolis, but as Tonight's bassist (always a band's intellectual) puts it, "It was the decade of constant motion in fashion and music. Every year something new was arriving, the 1970's never had time to be dull!" Sharing the February 1978 charts at the same time as Kate Bush's first hit single, competing with American Disco, including the delectable Donna Summer, Rose Royce, funksters Earth Wind and Fire, New York new wave Blondie, sax urban myth Gery Rafferty's Baker Street (readers should seek out the gem of an urban myth that still haunts this tune), Free and Rod Stewart, Tonight were pulling their weight with heavy competition for the places behind Abba's inevitable (and inevitably dull) number 1. On this CD the live version of Spilling My Drink and the final track I Can Play Faster Than You demonstrate this band had the charisma and humour to hold and entertain an audience. The songwriting rhythm guitarist now lectures, indeed is 'Senior Lecturer in Music Technolgy and Popular Music' at Kingston University (formerly Kingston-upon-Thames poly, a name with more history and grassroots credibility), having earned a B.Mus Hons (Tonmeister) from the University Of Surrey before the Tonight days. "So do academic credentials behind power pop sensibility justify a place in these elavated pages?" demand plebs chorus, stage left, "What about the sound quality?" It's a good transfer capturing the vivacity of the original with no pretention to HiFi show demonstrations. British Lions a whole lot better than mere Mott for having let go of any Hoopling tendencies that were simply no longer possible without the Hunter in the driving seat. Forget this particular rock family tree, British Lions were a no nonsense British rock band. OK, there's some proggy nonsense but that's what we Brits always do best, and a band that names themselves after the all UK Rugby team, or indeed after the little inkstamp on British eggs, do well to retain their British eccentricities. 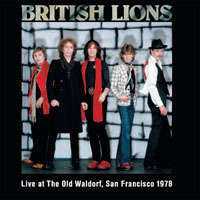 Never attempting anything groundbreaking or shocking, British Lions succeeded at bouncing along with solid rock rhythms and quirky English lyrics, which are showcased here in live performances with enough raw texture combined with just enough playing and production gloss to make worthwhile on real stereo systems of the quality to which TNT-audio readers aspire. Mature playing, mature issues addressed in lyrics, mature production with space for the material to breathe invite mature listeners to feel at home rather than to relive youth hearing cover versions by tribute bands, which seems to be the unfortunate fate of so many musos these days. Hence it's more Doobie Bros than skin up a doobie for Stray, so compelling that your mature scribe forgot to make listening notes, or perhaps that's just an excuse to listen again. This is the CD that reminds us that a big push-pull valve amplifier through paper cones and compression horns has as much place in the domestic listening room as single-ended couture or bipolar T03s. "'im agaiyun" challenge plebs chorus, stage left, "He'm keepin they owuld scroibe bizzay." The remixes reduce the reverb and permit the exemplary musicianship to appear more explicitely. Wulfrunian workaholic Robin George has reworked a key opus of his career. Dangerous Music marked his arrival as a solo writer and performer of maturity and he knew it then and still knows it now. Critically well received in its day, it's a risky venture for anyone to rework something familiar to fans, but this might well introduce some newcomers to Robin George's oevre. In the opening track Heartline (that appears in 3 different versions here) your old scribe begins to wonder what happenned to someone whose other work I respect but by track 2, Spy, the ears are warming and track 3, No News is Good News, convinces despite 80's drum cliches. Track 8, Hit List, should have been a single and the 4 bonus tracks add some variety to the mix, literally. Robin George might want to seem dangerous but his lyrics give him away as Mr Nice Guy. Robin has played with Robert Plant, Phil Lynott, Roy Wood and Carl Palmer in a career as varied as it is long; this was his first opportunity to please himself and he's having a second bite at the same cherry using modern technology to improve the original rather than the prevailing dumbing down of the major labels. 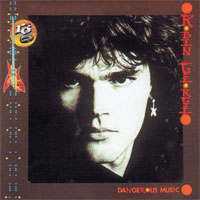 Dangerous Music showcases Robin's versatile guitar and songwriting skills and makes a refreshing change from the well trodden clichés of 80's rock standards. With a name like Tommy James & The Shondells, eager readers might expect a 60s wall of sound and analogue reverb and this guy has shifted over hundreds of thousands of recordings units in his career. However, on this outing, production values are modern tight and songwriting ranges from reminiscent of Van Morrison to Sammy Cahn ("Sammy's words fit my mouth the best of all the writers" - Frank Sinatra), Hoagy Carmichael, Ira Gershwin or Carl Sigman. Those years writing Boadway hits have been (rather luxurious) journeyman training towards this consumate skill. 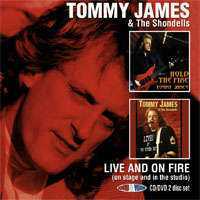 While your old scribe is no Broadway boy (having a musicals blockage after Kurt Weill) Tommy James' voice and songwriting are captured well enough to realise that live this man will have the room eating out of his hand. On the other hand, this is a disc for lovers of that songwriting genre, not for heavy rock fans or avante garde jazzers. 80's ROCK BAND hair styles entered whole new dimensions of aaarghiness. No other adjective yet coined does adequate justice to the awfulness of 80's (particularly muso) hairstyles. The awful hairstyles on the TaraZara CD case set low expectations, which were not disappointed. Listening notes from first play of this CD begin: Pompous narcisistic lyrics backed by crashing overblown 80's rock. At times sub-Queen and other times Sub-Rainbow with a bizzarre hint of 70's popsters The Rubettes! This 1984 recording sits at the Nadir of Post-Falklands election Britain. The few redeeming moments sound like 1974 but are therefore a decade too late. 1984 was the year of the last Stonehenge Free Festival where old hippies Hawkwind and The Enid were more original, but I suspect that TaraZara might have been a talented bunch hidebound by record company expectations and values whose big chance was destroyed by forces beyond thir control. TaraZara once supported Gary Glitter at Wolverhampton Civic Hall after the his heyday was over. "The old scribe's opinion of 80's big hair has polluted his ears and this review is a worthless airing of prejudices," challenge plebs chorus, stage left, "We bet it's musically fine, if sartorially challenged." -worthy of the credits music for Spinal Tap maybe? Predictable vocal harmony hooks too often. Guitar solos self indulgent + make no musical sense or connection with songs!! TaraZara's members have all turned their talents succesfully to other avenues, including producing, and Danielz has been successfully fronting the pre-eminent T Rex tribute act, T.Rexstacy since they formed. 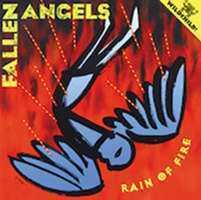 Your old scribe is uncomfortable writing an irredeemable review, but the only reason to hang on to this CD is to prove just how low rock musicians were willing to sink for a recording contract in 1984. 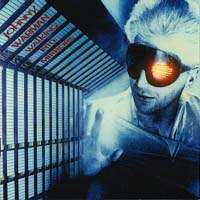 The ludicrous shades on Johnny Warman's head on the CD case also set low expectations but this time expectations were confounded. Listening notes from first play of this CD namecheck commercially and critically successful performers of the period, but for this listener, David Bowie, Ian Curtis and John Foxx (especially the latter) spring to mind immediately. 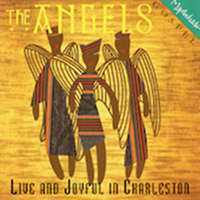 Further listening brings to mind Latin Quarter and Heaven 17 and if you like any of the above, you'll probably like this CD. Warman's confidence shows when he's not frightenned of a predictable rhyme, and has shifted over 100,000 units of Walking Into Mirrors since its first release exactly 30 years ago. Warman has been busy since then songwriting with the likes of Ringo Starr, Prince, Asia and gets Peter Gabriel in on this one. Production is slick without being too glossy, as might be expected from anything with Peter Gabriel's involvement, but some ploddy 80s reverb percussion sounds dated. There's no embedded information (like track listing) but 6 bonus tracks and enhanced CDR of two promo videos justify the reissue. A handful of artists like Johnny Warman and (almost inevitably, it seems from recent reissues) Robin George kept the UK rock music scene alive in the 1980s while the big record companies (more through ignorance, short-termism and, well, ignorance again rather than overt conspiracy) determined to undermine creativity, performance and recording quality. Meanwhile, intelligent Techno built on rock roots (like Orbital, Underworld, and The Orb and Jungle and Intelligent Drum&Bass in the UK built on UK dancehall reggae roots so here in 2010 we have the benefit of hindsight to fantasise that the dross never happened and the past was always a golden age of performance and recording quality. Well, the 50's wasn't all Mercury Living Presence and 2010 isn't all Mapleshade, so read the foregoing without expecting the conclusion to tell you the answers in a paragraph. Go out of your house/appartment/tent and buy more vinyl/CD's/hi-res downloads NOW! Orbital: Belfast/Wasted 12inch plus BBC Peel Session September 10th 1993 (the late great John Peel was probably more important than any producer or A&R man on the UK music scene since 1970. Your old scribe sometimes needs to disconnect from the review material while writing and Orbital brought the UK music scene back to life in 1989 with Chime. "mixed bag and 2 months late,", heckle plebs, stage left, "the old scribe's slipping agian"
"too busy enjoying the tunes", observes the venerable one, sagely, from a high place.